Chic, easy blouses are a staple in my wardrobe. They look great with jeans and flats when you just want to throw something on in the morning and still look put-together, and they are perfect for tucking into skirts or shorts. Most importantly, flowy blouses are just really comfortable and usually very flattering! I picked up two printed flowy blouses recently that I really like. The first is by Elizabeth & James. For those of you who are unfamiliar with the brand, it's a contemporary label designed by Mary Kate & Ashley Olsen. They named the line after their younger siblings. I enjoy their aesthetic but I am usually unimpressed by their quality, at least for their price, so I tend not to buy things from E&J unless the quality of the item is up to my standards. I remember I fell in love with an Elizabeth & James coat at Bloomingdales a few years ago...it was pretty pricey ($600 or $700 I believe?). I kept coming back to it every time I went to Bloomies, and alas, I noticed that all of them had buttons missing and falling off. That is unacceptable for something so expensive. They hadn't even been worn! That being said, I really love this blouse. It's a style that is one of my favorites. I love that it has something you can tie in the front! I can tie it into a bow, just tie it and let the pieces hang, or not tie it at all. You can buy basically the same E&J blouse, albeit in a different print, here. I need more blouses like this. For spring, I'm really looking for nice prints, mint, blush pink, and coral. I love this print so much. I want to get some bright cobalt blue skinny jeans to wear this with. And loafers! I want loafers so badly but I can't seem to find the perfect pair at a good price. The next blouse I got is from Joie. Joie is a favorite of mine. I love their blouses, they are very chic and easy. This one is no exception! The neckline is extremely flattering. I also adore the sleeves - they have an underlying cream layer that is a sweet little subtle detail. Here are some of my printed blouses! I don't have many belts for some reason, but recently I've been looking at belts more in stores. I'm pretty picky about belts - I prefer skinny belts and don't really like thick belts usually. I loathe belts with like....that stretchy black thick strap, if you know what I'm talking about. I prefer gold hardware and I am very picky about leather quality in belts. This particular belt I found at a Salvation Army store for 50 cents. It's a lovely color and I actually quite like it. The leather is great quality and the color fits in well with my wardrobe. The belt is by Coach! I got some new jeans recently as well. I found Seven For All Mankind jeans and shorts, brand new Moschino trousers, and Current/Elliot jeans for $15....total. I do not like this little diamond rhinestone thing the back pockets have going on. I will probably peel these rhinestones off. LOL! The 7FAM jeans I got are the Josefina model. 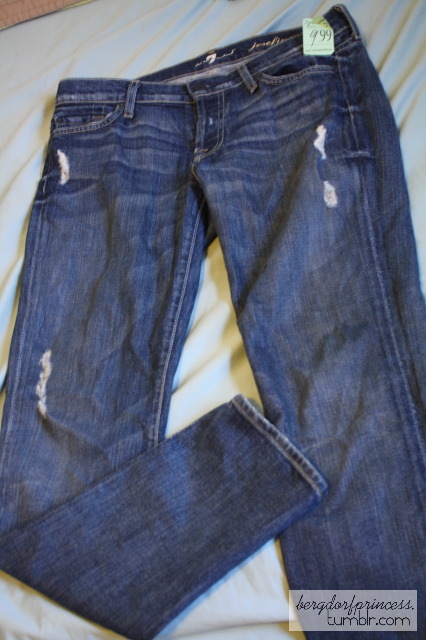 They are slightly destroyed, which I am usually not a fan of (I was a destroyed jeans fanatic at some point in high school though LOL! ), but I think it is very subtle and the destroyed element is hardly present. These were $5 (half off). *_* You can buy the Josefina jeans here, albeit for like $198. :( The 7FAM website has them for $59 here!! :) They've been worn by Lo Bosworth, Jessica Alba, Liv Tyler, Rosie Huntington-Whiteley, Renee Zellweger, Halle Berry, Reese Witherspoon, Cameron Diaz....I just looked them up right now on Google Images and they seem to be a celebrity favorite lol. That's not why I bought them (in fact, I was not aware of this detail at the time lol), but it's interesting! Nothing on the back pocket, hallelujah! Cute but very subtle zipper detail on the calves. I will probably not be sporting these unzipped, as that's a little 90's for my taste, but I love it as a detail. The fit is super skinny, which is perfect! Finally, the brand new Moschino trousers! These are supposedly a size 8 but they're more like a zero. -_- I wish there were a more universal sizing system. So many brands do vanity sizing and it's ridiculous that while you might be a 2 in one brand, you'll be like a 10 in another brand. There's so much stigma attached to sizing, too. Fit is more important than the size, which is something I have to remind myself sometimes. Sizes should just be like "Awesome," "Fabulous," "Stunning," "Gorgeous," "Beautiful." LOL! This photo is really unflattering. 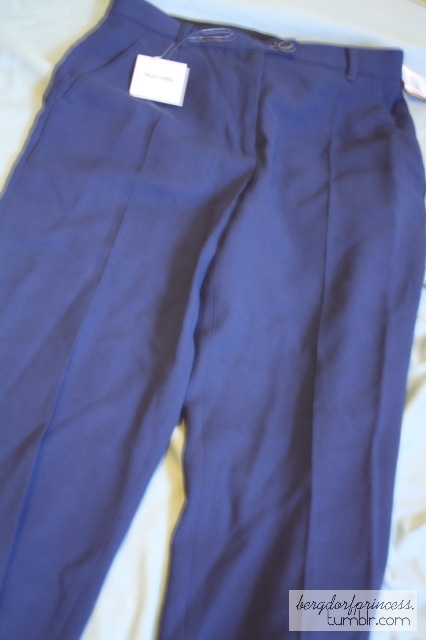 They're just simple blue trousers that apparently cost $525. I might sell them to a consignment store or keep them; I'm not sure yet. This post is growing endlessly long, but I'm almost done, I promise! Lol. 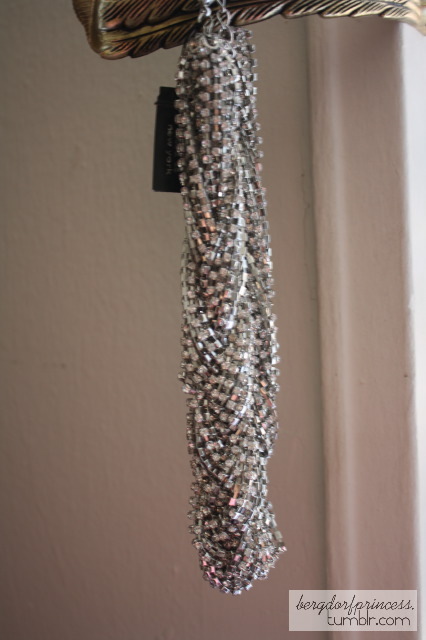 I ordered this Cara Couture necklace from Gilt Groupe and I love it. It's such a statement piece and it looks so luxurious. It frames my face very nicely and I can't wait to wear it to an event. It will also look so great under the collar of a shirt or something. Cara jewelry is sold at Nordstrom and Henri Bendel, but I've also seen it at plenty of discount stores like Loehmanns or Nordstrom Rack. These little vintage clip on earrings I just found today when I was taking photos....they were in the pocket of the 7FAM jeans! Lol. I am wearing Chanel May on my nails at the moment and it is such a pretty pink. :) I highly recommend it to anyone looking for a cute pink for spring. I think Chanel nail polish lasts quite a while in terms of chipping. It never peels for me, either. I am wearing it without a base coat or top coat at the moment and I've had it on for a few days, and it still looks perfect. I shall conclude this post with a photo of some noms. Om nom nom sushi nom. SUSHI!!! I also love how you ended it with "xoxo, gossip girl" lol. I love the jeans!! 7FAM are my dream jean!